An investigation by the Justice Department’s watchdog into missing text messages from the FBI-issued cellphones of former investigators Lisa Page and Peter Strzok recovered thousands of text messages on agency-issued phones belonging to the pair. But it did not attribute the missing texts to malicious intent on behalf of the two but rather a technology failure by the FBI’s tool meant to sweep up text messages, according to a new report. The investigation into Strzok and Page stemmed from the inspector general’s review of actions taken by the FBI in the run-up to the 2016 presidential election, when it uncovered texts between the two that expressed a clear preference for Hillary Clinton over then-candidate Donald Trump. The department discovered a five-month gap in which the FBI’s automated collection tool did not sweep up any texts from the phones both of Page and Strzok, coinciding with their time on special counsel Robert Mueller’s team looking into Russian interference in the 2016 election. Page and Strzok became scapegoats to some on the right after it was revealed that the two exchanged text messages critical of Trump during the campaign, including at a time when they were part of the team investigating Hillary Clinton’s use of a private email service while she was secretary of state. 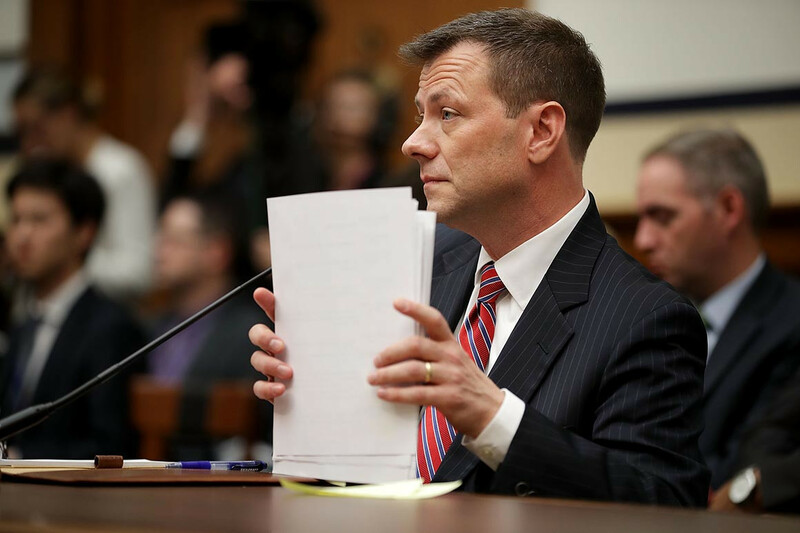 Trump and his allies have assailed Page’s and Strzok’s involvement in the investigations into Clinton and Trump as proof that the agencies are biased against him. The two were swiftly removed from Mueller’s team when their texts came to light, and both have since left the FBI. The Justice Department’s Office of the Inspector General forensically examined six different department-issued devices used by Page and Strzok and determined that while the department uses an automatic tool to collect and retain texts from FBI-issued devices, there is no department-wide policy mandating the retention of text messages that Page and Strzok had violated. The inspector general’s investigation recovered around 9,311 complete text messages sent or received on Strzok’s phone that it was able to date to the period of the collection-tool failure, and around 10,760 from the same period from Page’s phone, the vast majority of which were exchanged between the two, which the inspector general said resulted in overlap for many of the texts it recovered. An expert on Android phones obtained by the inspector general’s office was able to recover an additional 62 text messages during the period of the collection-tool failure and additional messages that fell outside of that window. Those approximations include only text messages that a forensic analysis could attribute a date and time to, the report notes, and they also do not include fragments of text messages recovered by the investigation. As a result of the investigation, the inspector general found a more widespread failure of the FBI’s collection tool than may have been previously known. “The FBi’s collection tool was not only failing to collect any data on certain phones during particular periods of time, it also does not appear that it was collecting all text messages even when it was generally functioning to collect text messages,” the report says. The watchdog said it would submit a recommendation for procedural reforms of the department’s retention of electronic communications by employees.